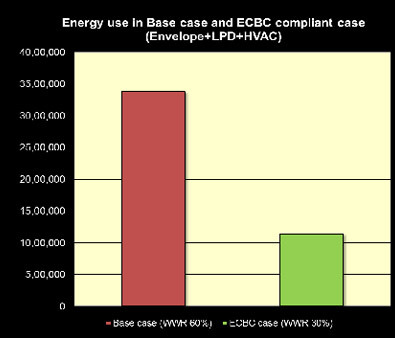 For more information on the ECBC envelope, refer Technical Information Section. 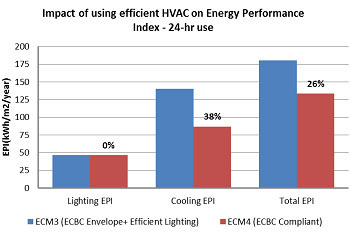 **Note: The energy saving potential of Energy Conservation Measures (ECM4), is calculated with ECBC complaint envelope + ECBC complaint lighting + ECBC complaint HVAC Design with optimum WWR strategies against Base case (conventional building). 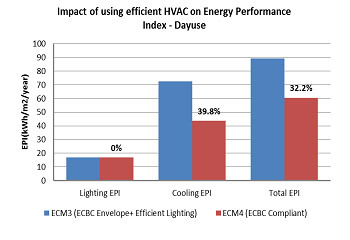 The Life Cycle Cost Analysis (LCC) of this energy conservation measure by using ECBC complaint envelope, Energy Efficient lighting, and Energy Efficient HVAC Design with daylight integration and optimum WWR was carried out under this project. The LCC of this case, considering 25 years is 962 Million rupees. The Pay back for incorporating the solar passive design strategies is found out to be two years. The LCC of this case considering 25 years is 2676 Million rupees. 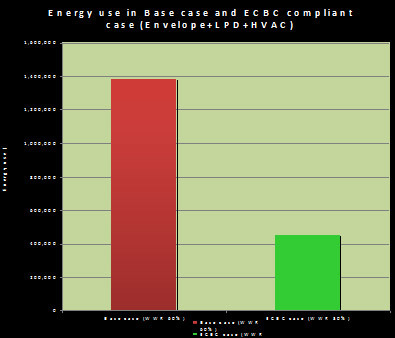 The Pay back for incorporating the solar passive design strategies is found out to be one year.